Twenty- and 50-round boxes of Littlestone Ammunition's loading of the .38 Special +P cartridge with 110-grain Barnes TAC-XP Solid Copper Hollow Point bullets. Hover cursor or click on photo for close-up view. Firearm not included. 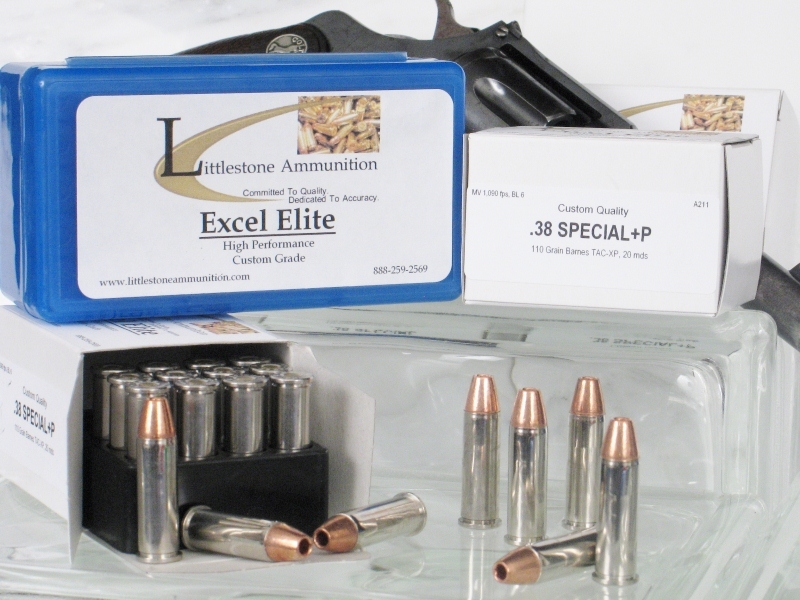 This is 50 rounds of outstanding Custom-Quality Excel Elite handgun ammunition from Littlestone Ammunition for your .38 Special +P revolver. This custom revolver ammunition launches a 110-grain Barnes TAC-XP bullet at 1,090 fps. Accuracy. Power. Super Penetration. Deadly Effect On Target. These are just a few of the outstanding qualities for which Barnes solid copper bullets are renowned. In this loading, they culminate in perhaps the worlds greatest 38 Special self defense loads. These hollow point bullets have earned a reputation of virtually 100% weight retention, expansion to about double original width, and extremely deep penetration. Barnes bullets also are well known for their ability to penetrate notoriously tough windshield glass and car doors. If you want an exceptional personal defense loading for your .38 Special revolver, this should be at the top of your list. Please beware of this: One competing company's mass produced factory ammunition of this loading currently retails for more than $20 more than Littlestone Ammunition's custom quality revolver ammunition. And that company also labels their version's box as having a velocity of 1,200 fps, but their web site tells a different story and more accurately claims only 1,050 fps. Feature 3: MV / Energy / Barrel: 1,090 / 290 ft lbs / 6"